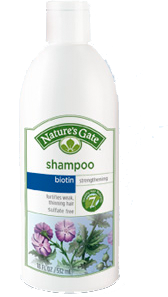 Our Biotin Shampoo helps fortify weak hair. Utilizing the strengthening properties of Biotin, an array of fortifying amino acids and our nourishing 7 Healthy Hair Nutrients, this shampoo helps hair look and feel stronger, vibrant and full of life. Water, Cocamidopropyl Hydroxysultaine (Coconut Derived), Sodium Cocoyl Isethionate (Coconut Derived), Disodium Cocoamphodiacetate (Coconut Derived), Lauryl Glucoside (Vegetable Derived), Glycerin (Vegetable Derived), Biotin, Panthenol, Hydrolyzed Soy Protein, Hydrolyzed Vegetable Protein, Simmondsia Chinensis (Jojoba) Seed Oil, Borago Officinalis (Borage) Seed Oil, Tocopherol (Vitamin E), Ascorbic Acid (Vitamin C), Hordeum Vulgare (Barley) Extract, Geranium Maculatum Extract, Olea Europaea (Olive) Leaf Extract, Viola Tricolor (Pansy) Extract, Sodium Riboflavin Phosphate, Niacin, Sodium PCA, Sodium Lactate, Cysteine, Arginine, Serine, Threonine, Folic Acid, Aspartic Acid, Ascorbyl Palmitate (Vitamin C), PCA, Glycine, Alanine, Valine, Isoleucine, Proline, Histidine, Phenylalanine, Polysorbate 20 (Vegetable Derived), Leuconostoc/Radish Root Ferment Filtrate, Hydroxypropyl Methylcellulose (Plant Derived), Glyceryl Undecylenate (Vegetable Derived), Sodium Hydroxide, Phenoxyethanol, Citric Acid (Vegetable Derived), Fragrance*.